I like the idea of a poll for the videos, but I'm fine either way, really! RE: discussions. Maybe after giving answers to the provided questions, people could come up with their own questions to keep the discussion active. I agree that we need to find new ways to keep the discussion flowing and I like @glitterintheair's idea! Maybe if we all come up with more questions, the discussion will flow more easily! I guess the "problem" is that there are not a lot of us participating but I don't think we can do anything about it? I think we may have more people participating now that the watch fest will last the entire day! You can choose multiple answers and we will watch the first few videos! Our watch fest is tomorrow, Sunday, January 27th! It will last the whole day, meaning that you can pop in whenever. I will make a separate thread for it in a minute. - Discussion: I will post the first set of questions. If/when you reply to them, try to add a question of your own! - If you're the next in line to reply, make sure you check what questions other people have posted! According to the poll, the winners were Trying To Live My Truth, HAVING A BLAST - Dan and Phil play: Keep Talking And Nobody Explodes, and Dan and Phil AND DOGS! Our next rabbit watch fest is this weekend - Sunday, February 3rd! To allow more people to join in without missing out on any other phandom activities that happen on Sundays (like the word war chats), we added a third watch time. We thought of getting rid of 7 PM altogether, but we previously held a vote, and people like the 7 PM - so we're not removing it, but adding a third time at 10 PM UTC. Our next watch fest is tomorrow, Sunday, February 3rd! This time we're hosting three showings: 1 PM, 7 PM and 10 PM UTC. It's IDB watch fest week once again! Reminder that he thread will be open ALL DAY! Timestamps are encouraged, but if you're not into that, you can always look at the starter questions and choose which ones to discuss. Of course, you are also welcome to make your own questions and reply on other's posts. Here's a reminder that our rabbit watch fest is tomorrow/today if you're a night owl like me! Sunday, Feb 17th. Three showings: 1 PM, 7 PM, 10 PM UTC. Rabbit made some (really dumb) changes to the way it works, so we won't use our regular link to watch - I will post the working link tomorrow before our first showing, and it will hopefully stay valid throughout the day. As promised, here is the link to today's watch party We'll be watching baking vids! hey kids! our third and last showing for the day will be starting SOON! We'll be watching ~Ancient Dan and Phil videos~ on rabbit! If Dan happens to upload, we can all watch it live too! The link to the stream will be posted on Sunday, because rabb.it had a stupid update. We are starting our first round in about 25 minutes! If you have any issues joining, please let me know! Update - we haven't given up on IDB watch fests! We just needed to take a little time to figure out where to take this project. The fact is, the last few IDB-only watch fests were mostly made up of myself, @lesterchuu and a few more regulars. The threads were very quiet. We don't want anyone to feel forced to participate in these, but we also put in quite a bit of time into them, so it would be nice if the interest was higher. - We will include more than just main channel vids. Side channels, SAP, radio, even tweets and instagrams. We will take all of that into consideration when discussing. Our next IDB-only watch fest will begin on Sunday, March 24th. The video theme will be Cute Phan Videos vs 2012-2013 era videos, liveshows etc. 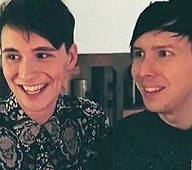 Basically we will compare Dan and Phil at their most natural, sweet and open to the darkest times in the Phandom. We're looking for video suggestions & general feedback on the changes! Please post here and remember, we also have a rabbit watch fest on March 16th-17th - most likely a weekend long stream of DAPG! 2012-2013 era videos? Oh boy this is gonna be painful and I've watched very few videos from that time because I'm not sure I could handle more but you know what? B R I N G I T O N. I wanna face my fears. anyone available to do a quick rabb.it test right now? Today is the day of our IDB Watch Fest! The theme will be 2012 vs 2016-2018, and this watch fest will run for the entire week. We will post a set of videos, tweets, blog posts etc every day and discuss them. This might possibly happen in the main thread, but I'm not sure about that yet. Updates: How does this work exactly? Each day, we will release a single topic (correlating to the theme) followed by a couple of questions that you guys can discuss and dissect. You can still pick and choose which set of questions you would like to discuss, so don't feel pressured to complete all - unless you feel compelled to! As opposed to our previous Sundays, we will now also be using other forms of media (videos, tweets, posts, etc.) or from sources other than their main channel videos (SAP, radio show, vyou, younow, 3rd party articles discussing DnP, etc.) to expand the discussion, so long as it stays relevant to the topic. You can use these as references to your post. Some of these media may or may not be from Dan or Phil themselves so things like tweets/posts made by fans (ie. theories, opinions, or rumours) should be taken with a grain of salt.